Several downhill tracks on scooters from the Kopanina lodge are ready for you! Would you like to rent a scooter but you do not want to physically work too much on it? Use our Downhill centre Kopanina Lodge where we can bring you by our microbus. 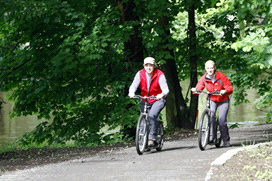 Here you can get refreshments and soft drinks and then you rent a scooter and set off for a great downhill trip to one of our bases along the Jizera river (Žlutá plovarna, Guest house and restaurant Křížky or Camp Dolánky). Here you return your scooter and if you do not want to climb back to Kopanina on foot you can use our regular microbus service. You can of course make it vice versa too - park your car in any of our bases along Jizera and use our microbus to come to the Kopanina Lodge where you rent our scooters for a downhill trip. There are seven scooter downhill tracks ready for you. If you did not know which is the most suitable for you, we will help you to choose the most appropriate one. For reservation of scooters from Kopanina or other information please call us on +420 775 580 388 or e-mail info@sundiskfamily.cz.